Mosaic Creative are delighted to introduce their new resource for churches in the UK, ‘Stories on the Street’. This manual is all about relevant church. For so many in our country, the church is seen just as a nice place to have a wedding or a funeral, but having no other part to play in the lives of ordinary people. Yet the church is at the heart of every community and has the potential to be so much more. This manual is written in 6 modules, each one containing creative Bible studies on the themes of vision, celebrating what we have, compassion, building relationships, understanding our community and stepping out in faith. Along with the Bible studies are a range of practical participatory tools that churches can use both in the church and also with their communities, with an emphasis on working together to address the needs of the vulnerable and marginalised. The hope is that ‘Stories on the Street’ will become part of the DNA of the local church and lead to community transformation. 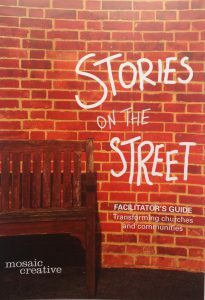 The name, ‘Stories on the Street’ is an acknowledgement of the power of story telling in the life of church and community. Many of the Biblical passages can be described as stories on the street, such as the woman who touched the cloak of Jesus, Blind Bartimaeus and the woman at the well. Using the participatory tools will lead to more story-telling and the best method of finding out if we are making a difference is my hearing people telling their stories of change.